Crop production in coastal areas is threatened by seawater intrusion, which increases soil salinity. Excessive salinity in soil and irrigation water, in combination with waterlogging, can significantly affect the growth and quality for agricultural crops, especially those vegetables that are sensitive to salinity. A new study determined salt-tolerant vegetable seedlings for coastal area production. Youping Sun, Joseph Masabni, and Genhua Niu, authors of a study that appeared in the May 2015 issue of HortScience, said there is limited information on vegetables' tolerance to seawater flooding at early stages of development. The scientists designed experiments to evaluate plant growth responses of vegetable crops to simulated seawater flooding. The study involved seedlings of 10 popular vegetables: eggplant, broccoli, kale, chinese cabbage, tomato, spinach, cucumber, radish, 'Red Crunchy' radish, and chinese greens. Flats of the seedlings were placed in a tub for 24 hours with either simulated seawater (SSW) or with tap water. The flooding completely immersed the growing medium, but leaves were not in contact with SSW or tap water. A control group of seedlings was not immersed. "We found no statistical differences in growth or physiological parameters between the tap water flooding control group or control group that was not flooded," the authors wrote. "In other words, 24-hour flooding with tap water did not have a negative impact on the growth of vegetables in the subsequent weeks." Because the chinese greens and cucumber seedlings flooded with SSW died at the end of experiment or two weeks after flooding, growth data were not collected for these two vegetables. Results showed that the other vegetables exhibited visible salt damage. "Chinese cabbage suffered the strongest reduction, whereas spinach, tomato, and eggplant exhibited the least decrease in dry weight due to SSW flooding in comparison with their perspective control," the scientists said. "Two weeks after flooding treatment with simulated salt water, net photosynthetic rate of broccoli, kale, spinach, and tomato was reduced by 43% to 67%, transpiration rate by 35% to 66%, and stomatal conductance by 51% to 82%." 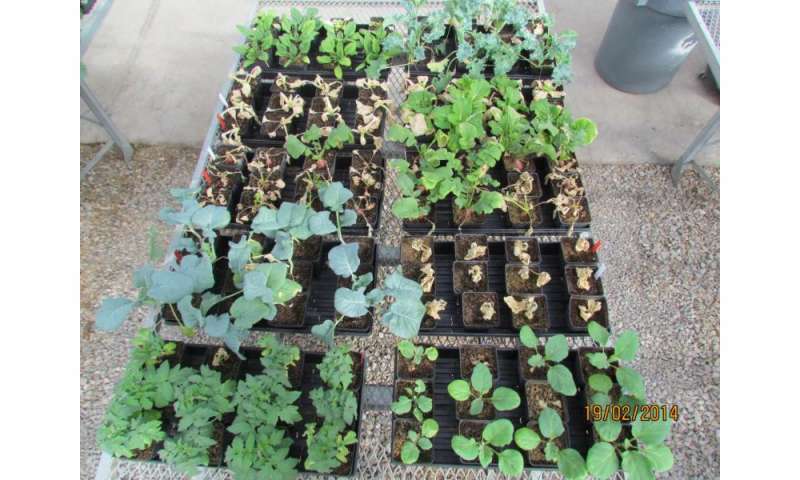 Overall, the experiments showed that spinach, eggplant, and tomato were the most tolerant to simulated seawater flooding, while chinese cabbage, chinese greens, and cucumber were the least tolerant. "Simulated seawater flooding significantly increased leaf Na and Cl concentration of all tested vegetables, but decreased leaf K concentrations in broccoli, chinese cabbage, eggplant, kale, spinach, and tomato and Ca concentrations in broccoli, kale, radish, and 'Red Crunchy' radish." The authors recommended that vegetable producers in coastal areas consider using salt-tolerant vegetables such as spinach, eggplant, and tomato to minimize damage to the vegetables and increase production.